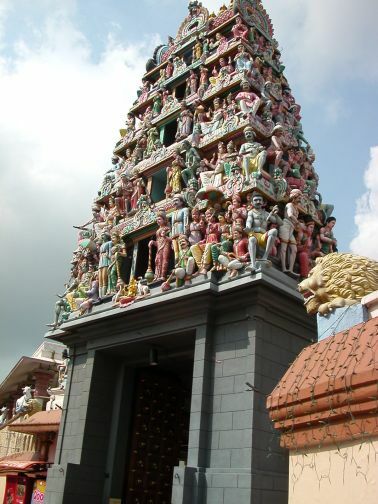 Singapore is a country of many cultures, religions and ethnicities. This is not only reflected in the sights and sounds, but also in the food. One of Singapore's most famous landmarks is the Raffles hotel, dating back to the city's colonial days, with it's iconic drink the Singapore Sling. This pink beverage in a tall glass is probably one of the "must eat" events on the island city. There are also restaurants and shops throughout the hotel that are worth a stroll, but probably not worth a stop unless you have a substantial traveling budget. In Singapore there is no need to pay through the nose for food. There are many food halls offering everything from Thai curry and rice to ram-en noodles and vegetables. If you like tea and haven't tried it before bubble tea is a must. The sweet tea beverage is delicious and refreshing with tapioca balls added which can be sucked up through the fat straw and chewed - it's like a meal and a drink in one! And, for around $2 Singapore, even if you don't like it at least you gave it a shot right? Something important to remember on any trip is that when given a tip from a local it is definitely worth following through. The locals know where the best food in the city is, and in most cases taking a gamble on the advice will turn out well. On a trip to Singapore a stranger on the train mentioned "chicken rice" - she said "You have to eat chicken rice". So, when Alex's Eating House on Beach Road popped into view and chicken rice was on the menu a stop was inevitable. For such a simple dish (rice with chicken and a soy-type sauce) it will really blow your mind. Apart from eating (which one could easily spend a week doing in Singapore) there are also many tourist destinations well worth a visit. For shopping, head to Orchard Road. It is the retail and entertainment hub of the city, with almost every brand imaginable represented on it's length. There is an extensive underground network of tunnels to easily cross between shops on either side, and food halls everywhere. Ngee Ann City, the largest mall on the strip, has one of the best food halls in the area on it's lowest level. Singapore Zoo is also a must for all travelers. It is truly one of the most unique and amazing zoos in the world. Spend a day strolling through the zoo or head back at later for one of the zoo's renowned night safaris. All in all, Singapore is a lively and interesting city, with plenty of activities to fill a few days or a week.